The perfect plant for the baskets and containers. Included in the bundle are a pair of durable brightly coloured 10' diameter hanging baskets. Together, once planted up, you will have the ultimate eye-catching, summer scorching display! The perfect combination - this NEW zingy coloured addition to the 'Non-Stop' begonia family has extra-large blooms plus a gentle trailing habit. Still with all the winning features of the Non-stops, a strong weather resistant habit, glossy green foliage and a very long flowering season, it's the perfect plant for baskets and containers. 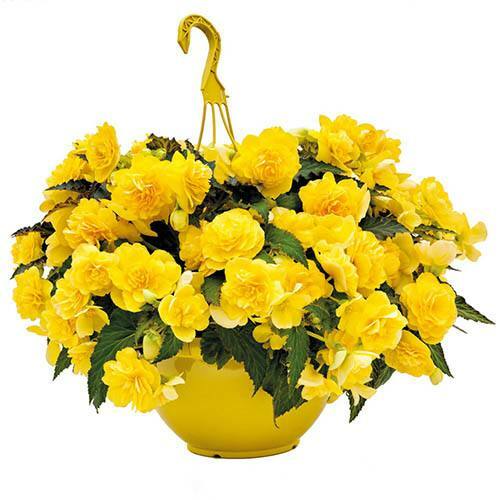 Included in the bundle are a pair of durable brightly coloured 10' diameter hanging baskets. Together, once planted up, you will have the ultimate eye-catching, summer scorching display! Supplied as 12 Jumbo Plug Plants (2.5 - 3.5cm diameter). Flowers from late May until first frosts in the autumn. Not frost hardy so keep protected until the last frost. Pot on for 2-4 weeks before planting.